Nottingham Students Against Cuts and Fees are organising big events this week that you should all come and get involved in. 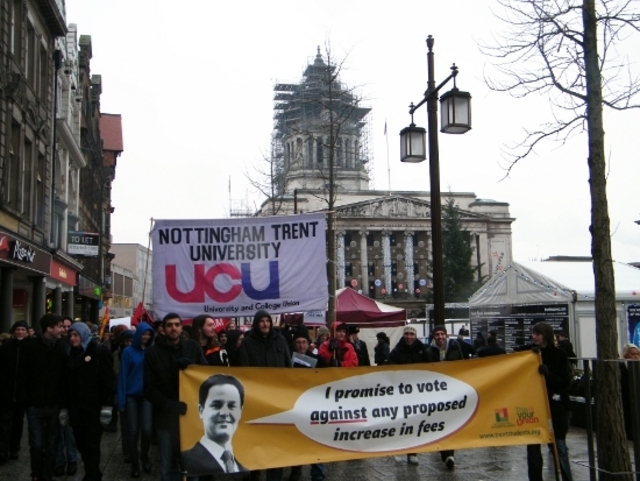 These follow the suspending of the occupation on Friday and the marching through nottingham on Saturday 4th December. Watch [video of the march] on the 4th and Billy Bragg’s views about the university’s ‘concessions’ put forward to end the occupation. The suggested donation for the coach is £5, but whatever you can afford. If you are interested, please email: nsafac@gmail.com with your name – Coach leaves 9am from Portland steps on Thursday 9th. Also, join the Facebook event. for the 9th December activities. This entry was posted in Campaign info, Events & meetings, Road to success and tagged city, education, london, video. Bookmark the permalink.